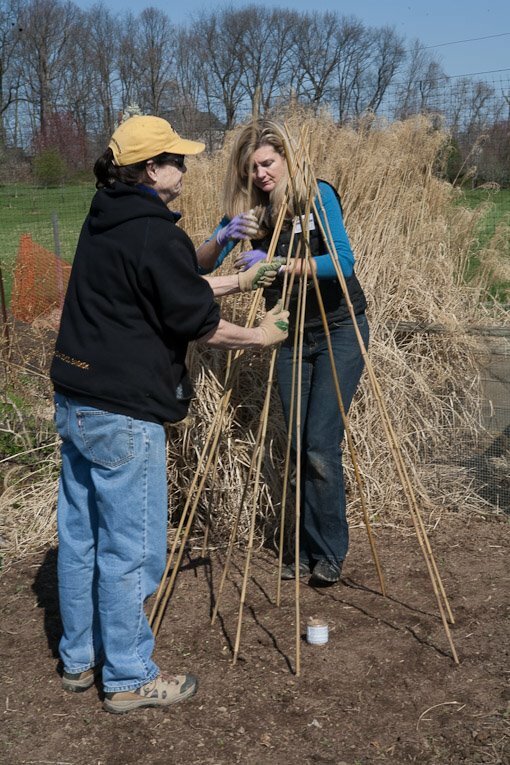 My name is Erica Smith, and I’ll be blogging over the growing season to keep you updated on the progress of the Montgomery County Master Gardeners’ demonstration garden at the Agricultural Farm History Park in Derwood. 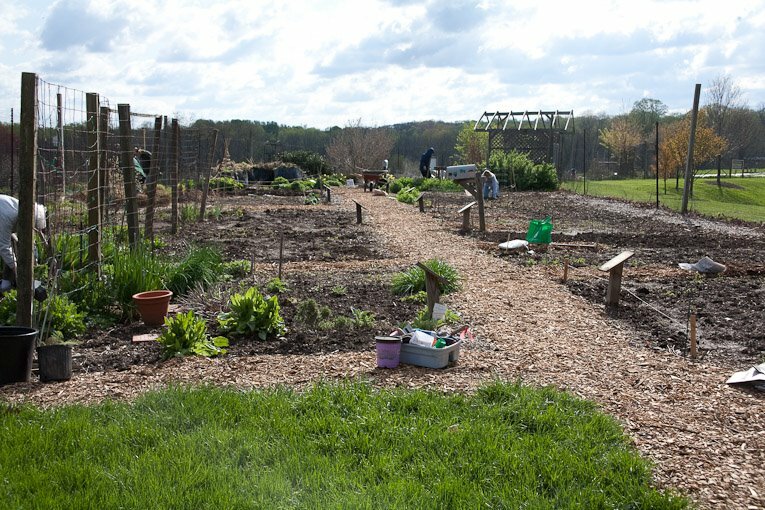 The garden is run by MGs Martha Fisher and Maria Wortman, and I am vegetable garden leader (as well as Montgomery Grow It Eat It chair). May is a great time of the year, as we move out of the spring planting season and into summer. 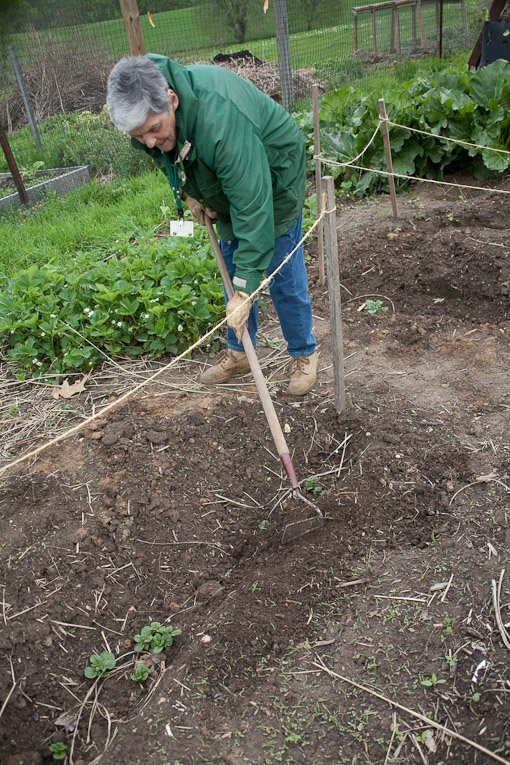 The soil is warming, slowly but surely despite the chilly nights and rain, and we’re ready to sow beans and squash and transplant tomatoes and peppers. April is anticipation time for us at the demo garden. We start work too late in the season (April 9 this year) to count on much in the way of spring crops, especially in a cloudy spring like this one. All our peas and lettuce are still tiny and about to be blasted by May heat. We do use April to get the garden well-weeded and tidy, to get our signs in place, to mark off planting beds, and to tend our perennial plants. I wouldn’t normally grow lettuce or beets as transplants, but these were planted out carefully arranged in a special bed we’re calling Edible Beauty, illustrating particularly attractive vegetables that counteract the notion that food gardens have to be utilitarian and scruffy. I think our whole garden ends up looking beautiful every year, but homeowners’ associations often have other ideas – show them our edible beauties and maybe they’ll change their minds! I’ll post photos of the bed when it’s underway. No eating those stalks until year three! It’s hard to resist. (Why does it seem to have gotten colder in the meantime?) The plants continue to be covered as they grow, until we can’t cover them any more. 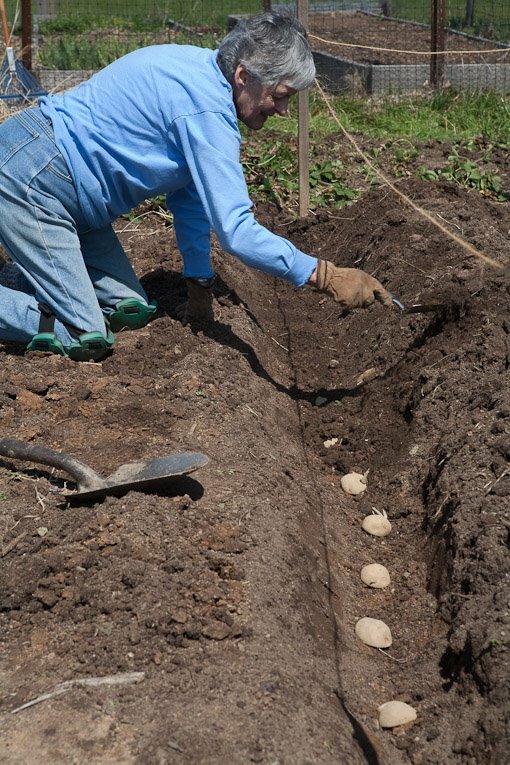 The deeper the potatoes are planted, the more tubers will grow on the spreading roots; think of them as growing up from the original sprouting potato section. (Sweet potatoes, on the other hand, you have to think of as growing down. But more on those later – they belong to May.) We can start harvesting the potatoes when the plants die back (or earlier), though we always let some stay in the ground until the first weekend in October for the big Harvest Festival at the park. The kids coming through the garden love to see the potatoes emerge from the soil. We’ll plant those beans this week! 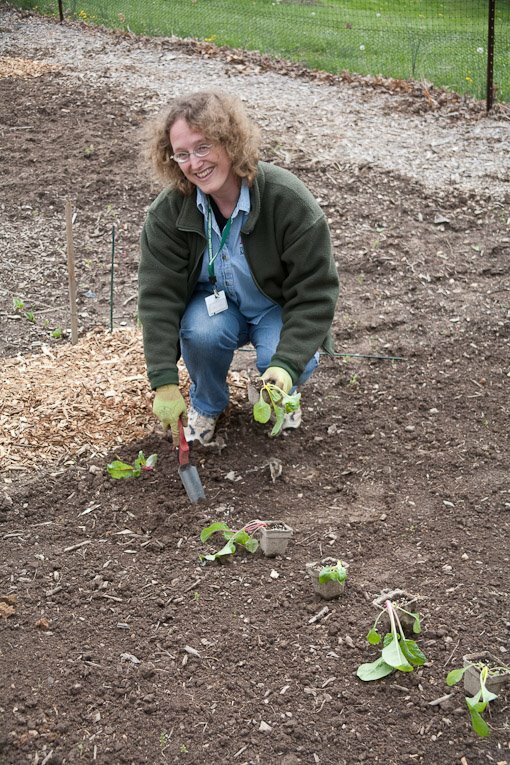 After some quiet weeks of anticipation and weeding and toting mulch around, we’ll have a fury of activity this Thursday morning, with lots of seeds and seedlings going into the ground. It’ll look like a growing garden instead of a framework. Watch this space to see the transition. 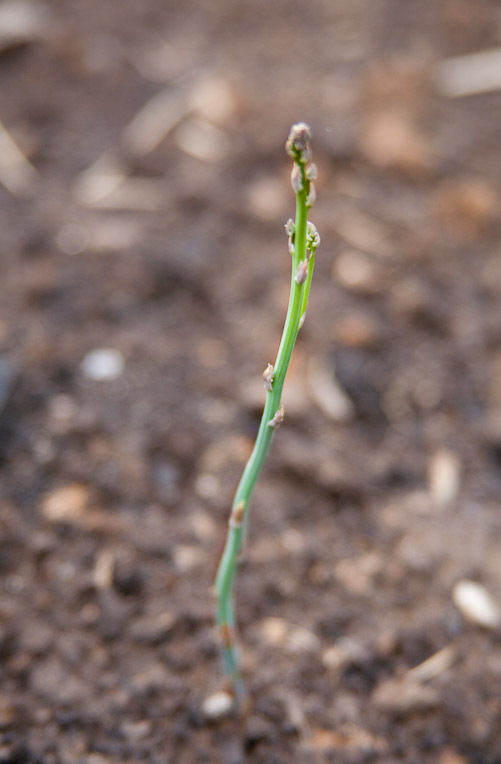 Erica, Thank you so much for agreeing to do a regular blog entry on what’s happening at the demo garden. Katherine, the photos are great. I confess I haven’t looked at Jon’s blog up until now and already I’ve found at least one good tip to use in my own garden — the sunken pots for watering squash. I’ll be setting out squash I grew from seed soon and I definitely will incorporate the sunken pots. One of the squash I’m growing this year is zucchetta which I saw in the demo garden and tasted at the Harvest Festival — and decided on the spot I wanted to try it this year in my garden. It’s so nice and crunchy, not to mention exotic looking — like a long snake. Looking good! I love that there’s an “Edible Beauty” section in the garden. One of my favorite edible beauties is ‘Red Giant’ mustard greens. They overwinter well here (Rockville) and the foliage is gorgeous in the early spring. 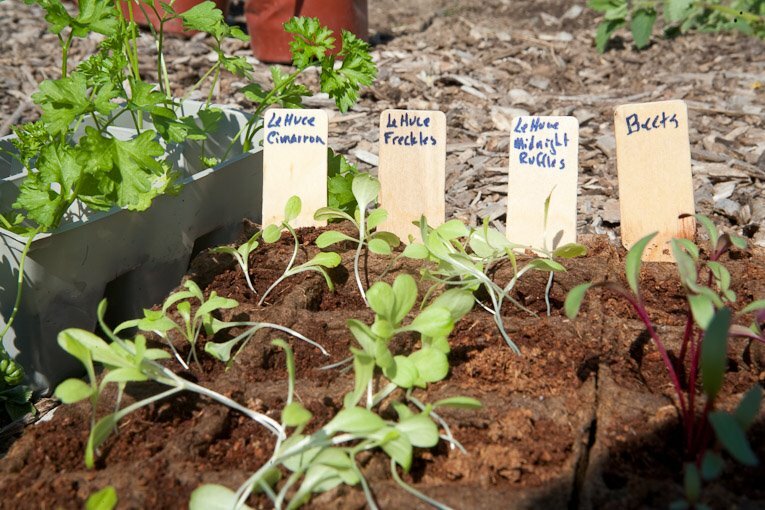 I have a few seedlings I can donate to the Demo Garden, if you’re interested (although…I don’t know how well they’ll hold up in the hot summer…best for cooler weather). Christa, I’m holding back on mustard and other brassica family plants for this spring because of the problem we had with harlequin bugs last year. I have one trap crop of mustard growing (not the pretty kind) and hope to catch a lot of the bugs on it in early summer, then pull up the plants and throw them in the trash. In the fall those Red Giants would be terrific in the Edible Beauty bed, though, if we’ve gotten rid of the harlequin bugs. Liz, we’re going to grow the zucchetta again this year!